Getting ready for Rome? Fine tuning your itinerary so that it runs smoother than a brand new Ferrari? Of course you are. Don’t forget that there are things you can book in advance to make your life even easier. Keep reading for where to book and how. 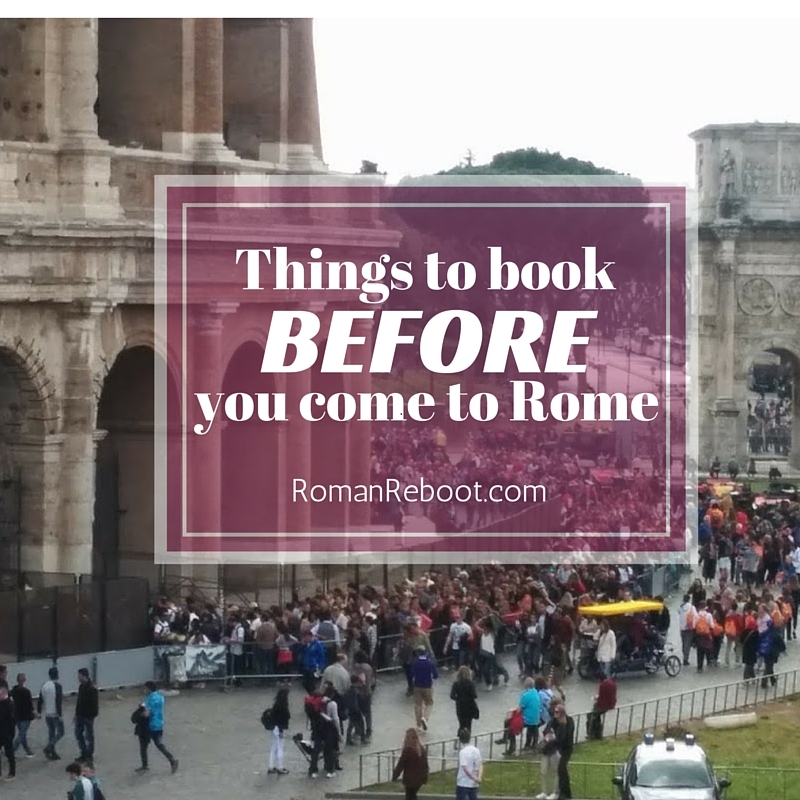 Yes, you may spend a few euro in booking fees, but your time in Rome is too precious to spend extra minutes waiting in line if you don’t have to! This one is the main MUST BOOK IN ADVANCE on this list. You cannot roll up to the door and buy tickets. Simply isn’t possible. You’ve heard about the horrific lines to see the Colosseum? Particularly in tourist season? It’s true. It’s all true. Guidebooks advise various strategies, such as waiting in line at a less busy Forum entrance, but why not double down and book your tickets in advance? You WILL still have to wait in a security line or with other people that already have tickets, but less time in the direct sun in definitely a win in my book. You can now buy timed entry tickets to the Vatican Museum. Game. Changer. Want an audioguide? You can book that online. Want to get a full guided tour? You can book that online too. Want to book a tour aimed at children 6 – 12? Apparently that is also a thing. This makes your life a bazillion times easier. Just do it. NOTE: During the summer, except for August, you can go to the Museum on Friday evenings, 7-11 pm. (Last entrance at 9:30 pm.) We did this once for a fun change of pace. My friend did this, got the first entry time, raced through the rest of the museum, and got to say she was the only person standing in the Sistine chapel for about two minutes. Besides the Vatican museum, don’t miss out on other exciting Vatican opportunities. Like a tour of the Vatican gardens. If you are here April – October, I HIGHLY recommend checking this out. You can see the Forum of Augustus and the Forum of Caesar. For Augustus, you sit on bleachers and watch the lights. For Caesar, you enter through Trajan’s Forum and then are on the move. Both tours with headphones with eight language options. Seriously, this was so cool. They show you how things used to look. They show you maps. They show you destruction of the neighborhood in the 1930s that led to us being able to see the Fora again. Because it is at night, you can squeeze even more into your already packed sightseeing day. Bonus! That covers your main attractions, but why stop there? This is obviously only a fraction of what is available, but plenty more fun stuff you can book in advance. Speaking of squeezing more into your day, you can also visit Castel Sant’ Angelo at night during the summer. I did this. It was pretty sweet to walk on the ramparts of the secret tunnel to the Vatican by the light of the moon. The advertised exclusive guided tour was pretty limited, but you get to wander anywhere you want after. Book tickets for 2016 here. This link may not work for other years. Try googling around for Castel Sant’ Angelo at night. Did you know that you can visit Nero’s Golden Palace? Well, at least until September 25, 2016. These tours fill up fast. Book ’em while they’re hot! one of the jewels of the Renaissance in Rome. The tours offer the opportunity to discover the atrium of Sangallo, the yard, the garden, the Hercules Salon and tapestries inspired by Raphael’s frescoes and the famous Carracci Gallery, recently restored and reopened to the public, Chief absolute work of the Carracci brothers commissioned by Cardinal Farnese Odorado late sixteenth and early seventeenth century. If this interests you, English language tours are available on Wednesdays. Sadly, no kids under 10 admitted. I love food. You can easily get amazing food in Rome. You can also easily get very meh food. You only have so many meals here. Gotta make ’em count! Food tours can be a great way to maximize your travel time. You get to tour a neighborhood you might not otherwise see AND you get to try lots of delicious food? They may look a little pricey, but I think it is a pretty decent value when you consider you are getting a four-hour tour plus a lavish meal. You can find food tours that cover just about anything or anywhere. Eating Italy offers tours in Trastevere and Testaccio. (We had a blast on the Twilight Trastevere one.) The Roman Food Tour offers options in Prati and Trionfale. Food Tours of Rome offers many, including a gluten free option. Have you ever thought I really wish I could eat on public transportation? Or better yet I wish I could eat on public transportation while listening to live music and jamming around Rome? If so, Tram Tracks is for you. You get to jam out on an antique tram with booze (and food depending on which tour you pick). As they say on their website, “Have you ever danced to a live band in front of the Colosseum?” Nuff said. I can’t guarantee that you will see the President, but you can also visit the Quirinal Palace and gardens on your visit. According to the website, reservations are mandatory and must be booked five days in advance. You know what Rome has in spades? Churches. All the churches. Churches errywhere. They can become overwhelming. Monotonous. Boring even. Oh, another amazing church? Yawn. A great way to keep churches interesting is to do a guided tour. They point out things you’d never notice and give context to what you are seeing. Santa Susanna, home of the American Catholic Community in Rome, offers spiritual walks that hit multiple sites. An affordable way to get more bang for our buck. Did you know that you can visit a house where Mussolini lived at Villa Torlonia? Did you know that you can ALSO sign up for a tour of the bunker built to protect Mussolini during WWII? P.S. Prepping for your trip to Rome? Check out my tips on what to wear and what shoes to pack. Hi Melissa! We love this blog post! I am still sending it out to friends that visit Rome! Enjoy your last weeks there!